Egg drop soup is a really simple boiled chicken broth soup and is considered a Chinese comfort food. Egg drop soup (also called egg flower soup) is known as 蛋花湯 in Chinese. In its simplest form, the only ingredients needed are the broth itself, eggs, and spring onion (also known as green onions or scallions), but you can add extra ingredients to suit your taste buds. Some people like the broth for egg drop soup to be quite bland so the flavor of the egg can really stand out. But chicken or vegetable stock can be used to cook egg drop soup because it will make the egg drop soup taste so much better. 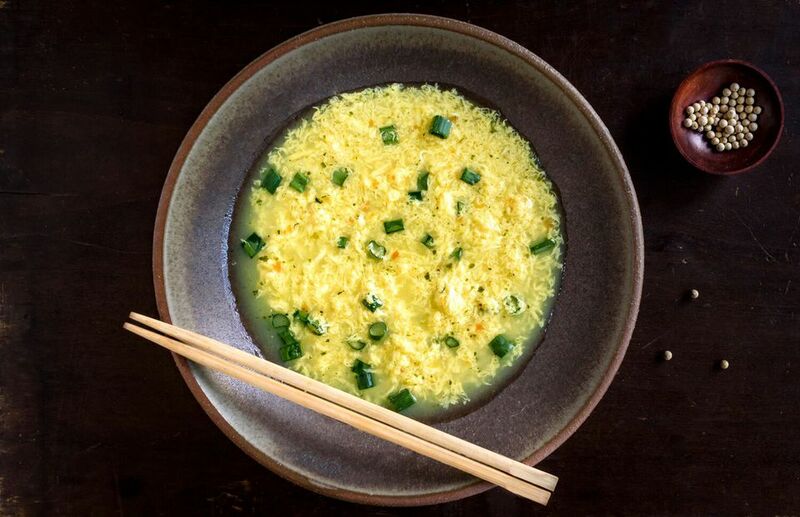 Many restaurants serve thickened egg drop soup (see How to Thicken Egg Drop Soup below) using cornflour/cornstarch or potato starch. Using potato starch will deliver a clearer soup while corn flour/cornstarch will produce a cloudier-looking, but still delicious, soup. If you are preparing this easy egg drop soup recipe for someone who is ill, try adding some fresh ginger. Among its many benefits, ginger is believed to be a remedy for treating colds and flu. In a wok or saucepan, bring the 4 cups of chicken broth or stock to a boil. Very slowly, pour in the lightly beaten eggs in a steady stream. To make shreds, stir the egg rapidly in a clockwise direction for 1 minute. To make thin streams or ribbons, gently stir the eggs in a clockwise direction until they form. Season the soup with white pepper, salt, and sesame oil. Pour into bowls and garnish with spring onion. How to Thicken the Soup: In a small bowl or measuring cup, mix together 1 to 2 tablespoons cornflour/cornstarch or potato starch with 1/2 cup of water until smooth. Slowly stir the paste into the chicken stock before adding the eggs. Proceed with the rest of the directions.